I entered my 184th contest here on BGG. Still expecting to win every time like a delusional Alzheimer patient. I was surprised to see how many of the 184 games that I own. Here is my list on contest loss/owned games. I gave up counting my losses long ago. Burned up 2 computers trying to count that high. Instead, I've tried to make it positive and take pride in my incredible streak of non-wins. 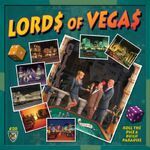 Got Lords of Vegas in a trade. Bought Ticket to Ride: Alvin & Dexter. Won Homesteaders from some other non-BGG contest. Got Tzolk'in: The Mayan Calendar in a trade. Bought Dungeon Lords: Festival Season. Bought (and still waiting on) Zombicide: Toxic City Mall. Bought (and still waiting on) Zombicide Season Two: Prison Outbreak. Won Clubs at a game convention. Great Fire of London: I got the first edition from the publisher. A huge mistake. Nice game, terrible publisher. 12 Realms: Not got yet, of course. Subscribed to a German crowd Funding running in parallel to the Kickstarter, as the Kickstarter postage made it a non-starter. Pirates vs. Dinosaurs Again, backed on Kickstarter even though I didn't win. Kings of Air and Steam Got it from a backer for a bargain soon after they were sent out. Terra Prime Found one on a BGG auction for a nice price. Is it a coincidence that 4/5 have art by Josh Cappel? I guess the real question is how many ended up on the wishlist or were purchased simply because they had a contest? Bought because the contest piqued my interest, and it was on sale at CSI. This is the first game I purchased directly because of interest from a BGG contest. Purchased after playing the game, not because of the contest. Purchased while still on Kickstarter. The game looks interesting, I just haven't gotten around to buying it. I'm obviously not too enthralled since I've waited this long. I want to give Escape a try, but I don't want to buy it first since I hate dice games. Contest brought to my attention and it looked interesting. I will probably buy this eventually. I wouldn't have known about this game without the contest. I want to play. Another game brought to my attention because of the contest. I really want to play this, and will probably buy it if no one else in my group does first. I probably would of learned about this expansion eventually. I own and enjoy Belfort, so I will probably pick this one up. This one is on my wishlist, but I can't even remember why now. I know I wouldn't have seen it were it not for the contest. I may have leared about this eventually, but the contest is how I lerned about it. I've already played one game with it, and I will eventaully buy it. I actually won this contest (2nd runner up). Got some promotional items, but no game. 1/104, got Lost Valley (original print) through an auction....contest had nothing to do with it. What's the record for most contests without a prize?